Pinned tabs - got tabs you want always open? Right click on a tab to pin it so you can't accidentally close it. Startup options - by default, Opera always starts where you finished the last session. Go to O>Settings and, in "On startup" choose between "Continue where I left off", "Open the Start Page", "Open a specific page or set of pages". Custom search engines - besides pre-installed search providers that Opera ships, now you can add your own searches. For example, to configure "d" to search DuckDuckGo, choose O>Manage Search Engines, and under "Other Search Engines" add "DDG" in the first input field, "d" in the second to define the shortcut and "https://duckduckgo.com/?q=%s" in the third. This tells Opera which URL to send your search query to, and "%s" is where it adds your search query. We're working on a search field context menu option to make it even easier to do this. Read more about developing extensions for Opera. Work continues on bookmarks support, synchronization, tabs enhancements. Opera 18 Next should be available very soon. Download Opera 17 for Mac and Windows. Could you add something like %t that would search for given text without encoding it? Would be handy for sites where the search term is in hash. But is there a way to make a custom search engine "Default"? I'd try this out ... if there was a version for Linux. Thanks for Opera 17 final release, using it now. You have to enable it in Settings. Seems to me that Opera is finally in the way to becoming what it really is. And I will be proud of you, developers, and of using your browser. And also of saying that I use the master piece of software that it will become. - A way to import bookmarks and history from other browsers for the time I was been forced to use other browsers. - enable it in settings. I think it should be enabled by default, like on Opera 12. Thanks for another great update. It did reset my Speed Dial background to default though, OSX 10.8.5. I thought you could right click to hide extension icons in this build? I must be mistaken. That's O18+ feature. Incoming in next soon. Nope, please use extension for that or external app. OK, nice, Buuuuuuuut, installed virgin on my wife's Win7 x64 system with conventional 12.16 install, it cannot find and import bookmarks. It offers you the option, but when you go to the page that is supposed to list the bookmarks from 12.16, the list is empty. I had to resort to xmarks extension to import her bookmarks. Do you work on Linux builds? 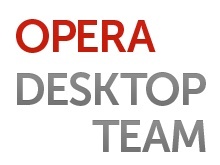 There will be a version of Opera for Linux, but not yet. Thanks Blazej for official info about the release, and detailed change log. Congrats for the first stable version, which includes the "Startup Options", and the "Quick Access Bar" for bookmarks. Which version of Opera 12 did you use, 32 bit, or 64, which was not recommended? Blazej, Bruce, any chanses to get page dimmed after alert? Works in Opera 12.50-, for popups in settings, but not for alerts on pages. Things are shaping up nicely. Looking forward to forthcoming developments. Google Maps doesn't load when I'm signed into my Google account. Anyone else experiencing this? My stand-alone installation does not update automatically. Very happy with the return of the custom search engines! I have a question in regards to Pinned Tabs. Is it possible to retain pinned tabs after Opera restart in the similar way as it could easily be done in Opera 12? I guess Session Manager is no longer available, but is it possible to save a pinned tab in Opera Startup > Open a specific page or set of pages? I have a question in regards to Pinned Tabs. Is it possible to retain pinned tabs after Opera restart in the similar way as it could easily be done in Opera 12? /quote]Yes. In Settings, Continue from where I left off. You're not missing anything. Opera Next is not nearly as good as Opera 11.64 yet. Just use an older version — whichever one you prefer — until at least the end of this year. BOOKMARKS BOOKMARKS BOOKMARKS and save SSD ! I just noticed one thing... Opera 17 presents a little lag when closing tabs that Opera 16 didn't have. I have still problem using Turbo. Does anyone confirm this problem with Turbo is enabled? my.opera.com or operaturkiye.net is not working. I see, that helped; but still prefer Session Manager because no matter where you left of, Opera will always open a specific number of pinned and unpinned tabs every single time. Once you get all the features I need I will come back to Opera. I hate chrome but right now it is the only thing I can tolerate. When you get bookmarks that can be sorted like I have been able to do for years and I have more settings and per-site proxy settings etc I will come back. Until then all this is pointless. The screen froze and I had to close and restart the Windows Explorer through the Task Manager. A message of low level memory appearead and I needed to close Opera 17. Please, check out this issue. I have some extensions but I'm not sure if it is related. Maybe it's an issue/problem just on my PC. Hoping OperaLink is switched on when Opera 18 moves to the Next channel. Showing comments 1 - 50 of 93.